Candlebridge Fashions maiden launch was on Ebay in the Spring of 2002 and enjoyed over 8 years selling success as a very popular store. Shipping rates quotes are always accurate and in accordance with our national post system www.anpost.ie. There is also a small packing fee! I also like to include a free gift for all my buyers. 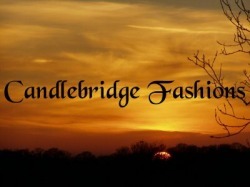 Candlebridge Fashions Ireland resumes trading on Ebay in the spring 2012 to celebrate their 10th Anniversary! I am based in Ireland. I have an honours degree in shopping (! ), a love for travel, foreign languages, art, literature, and going to the cinema. I also love dogs, I must do, I have six of the little rascals! I also like to compose classical music for the piano and I taught myself to play the tin-whistle. I take my tin-whistle on my travels. One of my best friends' who lives in Boston encouraged me to play a tune on my tin-whistle outside the famous CHEERS bar in Boston and I must say, I enjoyed the experience! I didn't make a lot of dollars but enough for a pair of gloves! It can be a little cold in Boston sometimes! Recent trips; I've been to the Great Wall of China in Beijing, Finland and stood knee deep in gorgeous snows of Lapland! I've been to many countries over the last few years and there are still so many I want to go to. In the Candlebridge Fashions Ireland online stores, you will find artwork, books, men & women's designer wear, beautiful jackets, music books, musical instruments and a few quirky things thrown in for good measure! I guarantee you will enjoy polite and friendly service, please drop into my shop sometime!! During the latter weeks of Autumn in 2009, The Candlebridge Fashions Design Centre was up and running and showcasing wonderful designs on the Zazzle website, offering top quality products and designs that are 100% designed by L.Shannon (original artist of the "Elegant Lady" logo) and ceased production of designs in March 2012. Apparently Irish Designers are required to fill out a US Tax form now to claim their paypal payments from Zazzle and I felt it in the best interest of my "design company" to withdraw my talents from their marketplace. I extend my sincere thanks to the buyers who purchased my designs and I will be relaunching my designs again soon on a brand new platform. In the Spring of 2010, The Candlebridge Bakery & Soup Kitchen also launched on the brilliant and innovative MYDISH website, all recipes are created and designed by L. Shannon and are easy to create with step by step instructions! In February 2010, The Candlebridge Fashions Design Centre proudly launched their designs with the brilliant SPREADSHIRTS website and there will be collections currently in progress making their debut exclusively to Speadshirts.com. Not only are there wonderful collections of designs to be introduced to the international market via Zazzle & Spreadshirt, but designer L. Shannon will also be introducing "Interviews With The Stars" so that you can learn more about wonderful International and Irish singers & performers and not to mention the co-writing a song with Chilean singer-songwriter Jose Promis who also features on this website, he happens to be one of my best friends! Check out my website! The Candlebridge Fashions Design Centre accepts commissions, please contact the Managing Director via this website. Thank you & Best wishes always. L. Shannon, Managing Director & Executive Designer of Candlebridge Fashions Ireland, 2018 ..
Catch up with all your favourite designs, 100% hand drawn by Irish designer, L. Shannon at Spreadshirt.com. For friendly customer service, check out my new store there!